Am pleased to say I didn't throw any food away last week. Every last scrap was used up, nothing was wasted. I'm pretty good at using up food but there's usually something which ends up in the bin. Let's see how I get on with this menu and food shop. Fingers crossed I've lost a pound or two when I weigh in later too. 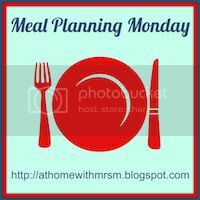 Don't forget to check in for more meal planning inspiration over at Mrs M's. Click the image at the top of the post.